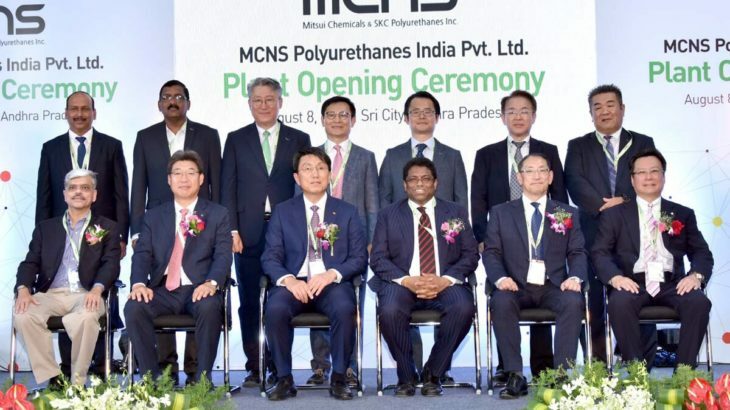 Sri City, August 8, 2018 :- MCNS Polyurethanes India, a 50:50 joint venture of Japan’s Mitsui Chemicals and South Korea’s SKC Polyurethanes Co. Ltd. (MCNS) hosted an inauguration ceremony for its newly commissioned polyurethane system house on Wednesday in Sri City. Mr. Ravindra Sannareddy, Founder Managing Director, Sri City along with Mr. Ki-Don Won, Chief Operating Officer, SKC, Mr. Tadashi Yoshino, Managing Executive Officer, MCI, Mr. Eui-Joon Lim, Co-CEO, MCNS and Mr. Shingo Shibata, Co-CEO, MCNS cut the ribbon and declared the plant inaugurated inaugurated. “As this region is growing as a hub for automobile, Fast Moving Consumer Goods (FMCG) and home appliance manufacturing, I am sure, presence of MCNS, a major conglomerate producing polyurethane, will certainly enhance the symbiotic ecosystem in Sri City, benefiting the manufacturers in those sectors,” he added. Mr. Shingo Shibata thanked AP Government for the excellent support extended and appreciated the cooperation and friendly attitude of Sri City team. The facility, which is the 11th manufacturing base of MCNS, set up in a plot of 5 acres at an investment of Rs.50 crore, will produce polyol based polyurethane foam products, with an annual capacity of 15,000 tonnes per annum. Polyurethane products are widely used in industries such as automotive, building construction, consumer durables, refrigeration, textiles & fibres, etc. MCNS, a global comprehensive manufacturer of polyurethane materials, founded in July 2015, capitalises on the premium strengths of its two parent companies to strengthen competitiveness in existing business, explore new business chances globally, and maximise synergy in marketing, R&D, and production. It produces polyurethanes at 10 different facilities located in overseas countries including the United States, Mexico, China and Poland. Through its joint venture with the Gujarat based Vithal Castor Polyols Pvt Ltd (VCP), MCNS produces bio-polyol. With the establishment of the Sri City plant, MCNS will be able to further develop its polyurethane business in India.